OCEANSIDE — Boats, sandcastles, live music and everything Oceanside will be featured at the annual Oceanside Harbor Days celebration, scheduled for 9 a.m.-5 p.m. Sept. 28 and 29. To help celebrate the city’s 125th birthday, a boat parade organized by Oceanside Yacht Club will add to the fun. Since sailing and recreational water sports are synonymous with Oceanside Harbor, the idea to include a themed boat parade was a given, said Kristi Hawthorne, event coordinator for the Oceanside Chamber of Commerce. “Oceanside Harbor Days celebrates the harbor — and the yacht club is a very important part of the harbor.” said Kristi Hawthorne, event coordinator for the Oceanside Chamber of Commerce. Oceanside Yacht Club is organizing the boat parade, which will include numerous vessels adorned with theme decorations. The boats will cruise through the harbor in front of crowds and judges. Back at the docks, judges from the Oceanside Chamber of Commerce will present awards for Best Power Boat, Best Sailboat and Best Overall — honoring winners with plaques and gift cards to area establishments. The parade is scheduled to be for 6 p.m. Saturday, after the day’s events. Free and open to the public, Oceanside Harbor Days takes place at the harbor over two days. Arts and crafts exhibits, family activities, a sandcastle building competition and live music will keep guests of all ages entertained. 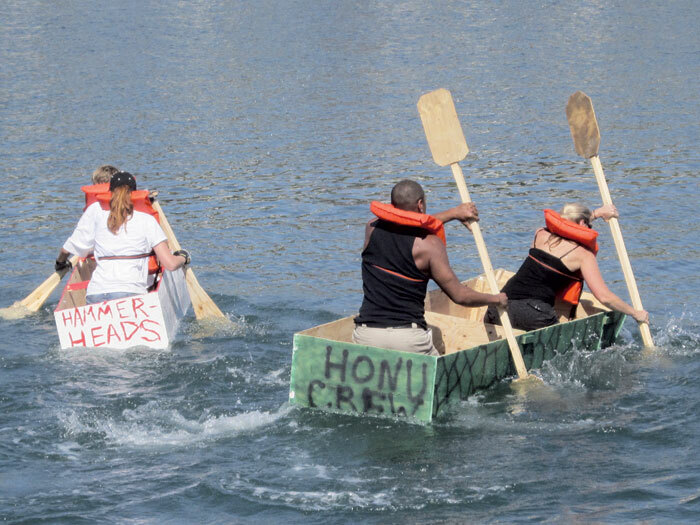 Self-proclaimed boat builders can test their skills at the Nail ‘n’ Sail competition, where participants will piece together a boat using materials provided by the chamber, before heading to the harbor to set sail aboard their handy work. Military displays, a beer garden, a 1.2-mile and 2.4-mile swim challenge and a fishing derby are also part of the fun-filled weekend. For more information on Oceanside Harbor Days, visit oceansidechamber.com. For more information about the boat parade, contact Oceanside YC at (760) 722-5751.